Nyrstar has initiated work to restart its Middle Tennessee underground zinc mines, which have been on care and maintenance since early December 2015. The Middle Tennessee operations include three mines—Gordonsville, Elmwood and Cumberland—and a concentrator, all located in Smith county, about 100 miles east of Nyrstar’s zinc smelter near Clarksville, Tennessee. The concentrator is located at the Gordonsville mine site. The care and maintenance workforce is being increased to facilitate mine development. Ore production is scheduled to begin during the first quarter of 2017, with processing operations scheduled to begin during the second quarter. Nyrstar expects the processing plant to reach full capacity of 50,000 metric tons per year (mt/y) of zinc in concentrate by November 2017.
over 12 months until the mill is at full production. Nyrstar also operates three underground mines—Young, Coy and Immel—and a concentrator in and around Knox, Jefferson and Grainger counties in east Tennessee, about 150 miles east of the Middle Tennessee mines. The East Tennessee mines continued to produce while the Middle Tennessee mines were on care and maintenance. Commenting on the Middle Tennessee restart, Nyrstar CEO Bill Scotting said, “This restart will allow Nyrstar to generate additional net positive cash flow resulting from the higher zinc price environment and will improve the quality of the feed book for the Clarksville smelter at a time of tightened concentrate markets. The Middle Tennessee operations produce very high-quality concentrates that our Clarksville smelter can capitalize on through its refining and recovery processes. The Clarksville smelter produced 124,000 mt of zinc metal and 157,000 mt of sulphuric acid in 2015. 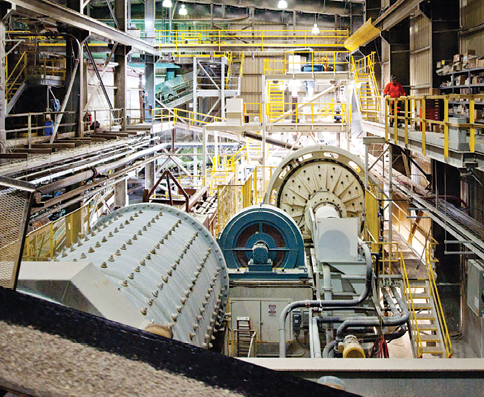 Noranda Aluminum, which initiated bankruptcy proceedings in February, has received court approval for the sale of its New Madrid, Missouri, aluminum smelter and facilities to ARG International for a purchase price of $13.7 million. The court approval followed an auction that took place on September 28. Noranda expected to close the transaction in October, subject to certain closing conditions. The New Madrid smelter was shut down in March. The smelter is fully integrated, with its own raw material unloading facility, environmental control systems and aluminum reduction plant, including carbon anode fabrication. Production capacity totals about 250,000 mt/y of primary aluminum. The plant site also includes a fabrication facility for the production of continuous cast rod, extrusion billet and foundry ingot. Noranda’s alumina refinery in Gramercy, Louisiana and bauxite mining operation in St. Ann, Jamaica, were not included in the auction for the New Madrid smelter and facilities. Noranda continues to explore strategic alternatives for the bauxite and alumina operations, including discussions with potential acquirers. Agreements, if any, would remain subject to auction and court approval. ARG International did not issue a statement regarding purchase of the New Madrid smelter. The company is based in Switzerland and was founded in 2013 by a former Glencore aluminum trader.